Successfully Added VGA to RCA + S-Video Converter Box - PC to TV Connection to your Shopping Cart. The VGA converter comes with 3 outputs, VGA, RCA (Yellow) and S-Video. This model is perfect for desktop home use. Just connect the CVHG-E48 to your desktop computer and use the VGA output to connect to your PC monitor, then use either the S-Video or RCA (Yellow) Cable to connect to your desired secondary LCD monitor. Finally, sit back and relax while your battle station is ready for ultimate multi-tasking. This is a simple device, though powerful it may be. It is designed to simply plug and play with no software installation required. Even better, the CVHG-E48 is powered by a single USB cable that connect directly into one of your desktop or laptop USB ports. With additional menu control function to allow screen adjustments, and onboard buttons to allows for PAL/NTSC switching, this PC TV encoder is ready to use straight out of the box within minutes. 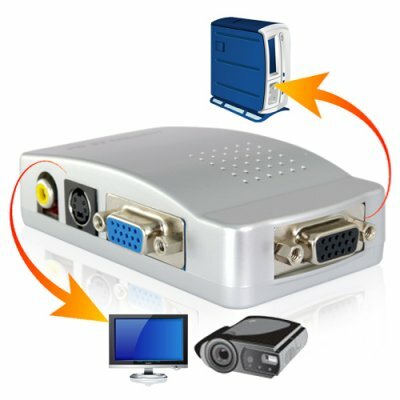 An excellent all round innovative and affordable VGA converter for all PC lovers. Get yours today and an amazing factory direct wholesale price, straight from the leader in wholesale electronics, Chinavasion. Does the E48 also support audio output? No, The e48 only supports Video output. Do I need any software to install the CVHG-E48 on my computer? No, The E48 is a plug and play device, no software installation is required. It's a great product to sell not too small and simple to use.